In this October 15, 2014, file photo, the world's largest cruise ship "Oasis of the Seas" docks in Southampton, England. 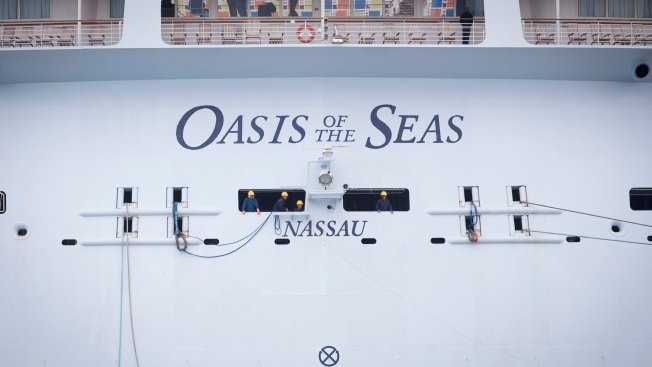 Eight people were injured after a construction crane crashed into Royal Caribbean's Oasis of the Seas cruise ship at a shipyard in the Bahamas. The incident happened Monday afternoon at the Great Bahama Shipyard in Freeport. The ship was in dry dock and there were no passengers on board, said Royal Caribbean spokeswoman Melissa Charbonneau. "We are aware of damage to the dock structure and to construction cranes," Charbonneau said in a statement. "We are assessing damage to the ship." Eight people working on the ship were transported to a nearby hospital for treatment, according to the Royal Bahamas Police Force. All of them had non-life threatening injuries and most of them have been treated and released. It's unclear what caused the crane to crash and fall.